God Bless Texas! What a great church website redesign we were able to carry out for a great Texas church! 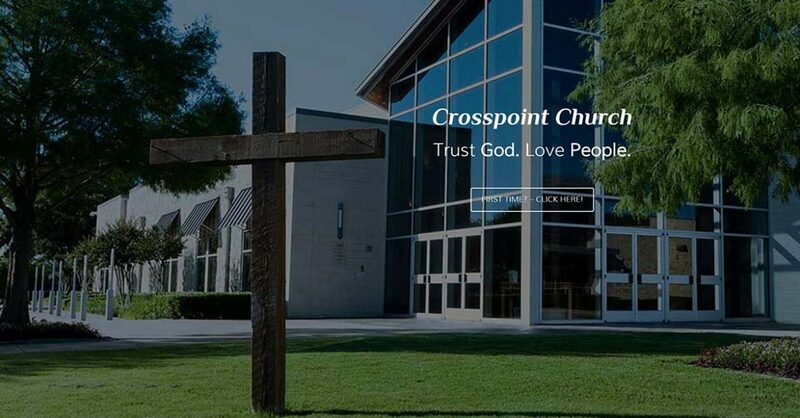 Crosspoint Church is a flagship church located in the great town of McCallen Texas. Working with Zoe Trewin and Pastor David Jordan there was truly a delightful experience for the REACHRIGHT team. When they first came to us, they knew how bad they were in need of a church website redesign but also shared they needed some direction for it. We were happy to step up to the plate and consult them well for this! After learning about their unique vision, key ministries, plus some; it became very clear to us we would be taking a bit of a different direction with their site. The website turned out to be different than a lot of church website redesigns we had done in the past. We carried out a unique strategy and designed some different elements for this particular project. We normally would not recommend the full-width main graphic to be the church building itself. That is typically viewed as a church marketing “no no”. However, the church shared with us that many people in their community identify their church and location because of the unique design of the front entrance of their church building. Their church logo is also a representation of this part of the building too so it turned out for this church that the front of their building was a memorable identity piece for people they were trying to reach. However, they also were a very family oriented church possessing many family ministries as well so we made sure this would be clear to people from their home page as well not limiting them to a picture of just their building. We designed a section on the home page that highlights their “heart” for families along with links a user from the home page to other family pages and content of the website easily. Typically any good church website these days will have some resources such as sermons, event information, sign-ups etc. These elements are great. Some churches need to provide a bit more, though. We discovered that Cross Point offers a ministry resource called “Home Point”. This tool provides helpful content and council for people in various life stages or circumstances. We designed under the resources section a well thought out piece highlighting and linking people to the content offered by this ministry tool. Oh, and by the way, there are also other specific leadership resources, sermons, and more on this resources page too. We are confident the church will see some great usage of this area on the site! So here is yet another web practice that we do not normally recommend since over half of all web browsing is from mobile devices now. However, the church had not only a lot of younger families attending but also a strong senior demographic that utilized the internet regularly. Crosspoint felt this feature would serve these folks well as they were browsing from desktops etc. Because the church also wanted to use this website as a great resource with important key content for members also, we all agreed this would be helpful. The neat thing is they also received a very mobile first approach with their content and pages. I guess you can say they “got the best of both worlds”! Does your church have unique needs and you need those to be carried out well online? Give REACHRIGHT a shot for your church website redesign and connect with us to share your vision!